Andy Bratton, a clergyman at the top of his game, recently asked an atheist at the top of his game: “What exactly is it about Christianity that causes you to reject it as a belief system?” The senior minister and the atheist had known each other for a long time, so why not get to the bottom of their differences? The atheist happened to be John Loftus, author of eight books on the falsification of Christianity, and he threw the question open for response on Facebook. At last count there had been more than 150 responses, which included thoughtful, compelling, forceful arguments against the Christian faith. Honestly, it was quite a lot to take in. 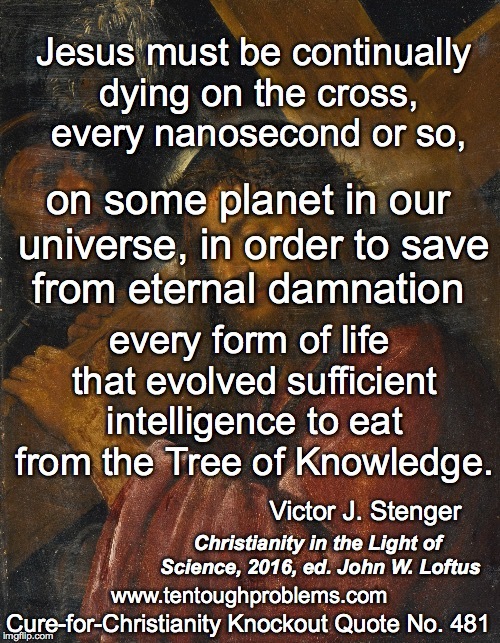 Actually, Christianity itself has a lot to take in. Not only does it suffer from grievous flaws and contractions (people of faith naturally prefer to divert their eyes), but our knowledge of the cosmos—including how our own tiny world works—has left theism reeling. The search for evidence of gods, outside of human imaginings and emotions, has come up empty. It’s understandable that most of the folks in the pews prefer to ignore the upheaval; they have no interest in leaving their comfort zone to find out why and how Christianity has been falsified. But shouldn’t we expect more from those who lead their flocks? But, as it turns out, the leaders can’t be expected to probe too deeply either. They aren’t trained to be rigorously curious about the faith. Seminaries exist to manufacture clergy, and the most difficult challenges are passed off to the professional apologists who are expected to engineer the best bluffs and excuses. For the most part, the clergy are satisfied. To see Loftus’ lengthy give-and-take with Bratton, here it is on Debunking Christianity. And ‘cosmic belch’? Of course, that would get a chuckle from his congregation, but we can suspect from this wisecrack that the pastor hasn’t done much to keep up with cosmology, one of the most fascinating scientific adventures imaginable. Especially since the invention of satellite technology, our understanding of cosmic origins has advanced dramatically. This stuff is thrilling; we are the first generation in all of human history to see so far back in time, to the early churnings of the cosmos. Check out the Wilkinson Anisotropy Probe and the European Space Agency Planck Probe. Why not try to find out, as precisely as possible, how the universe began? Instead of derisively referring to ‘a cosmic belch,’ revel in the details about how ‘everything just started forming’—from the researchers who have come up with so much data. And we’re on the verge of even more wonder. The James Webb Space Telescope, successor to the Hubble, is due to launch in 2021. But others in Newton’s wake demonstrated that this was not the case at all. The real excitement began in the nineteenth century, with the advance of telescopes and technology. But the drama intensified in the twentieth century. Few discoveries have been of such importance as the redshift. That story is worth a good read just by itself. See The Red Limit by Timothy Ferris, as well as his Coming of Age in the Milky Way. Such books are basics in the library of a scientifically literate person. Surely ‘religious experts’ are not entitled to speculate on the relation between science and religion without having read them, and absorbed their implications. It is one of the ironies of twentieth century cosmology that a physicist/Catholic priest figured out that there must have been a Big Bang (although he didn’t call it that). Georges Lemaître, Stenger points out, “… showed that Einstein’s general relativity leads to an expanding universe that accounts for galactic red shifts.” (p. 111) This puzzled Einstein himself, but it was Hubble’s work that confirmed it. Pope Pius XII thought that this was an Ah Ha moment for theology. The Big Bang must have been God’s creative moment. 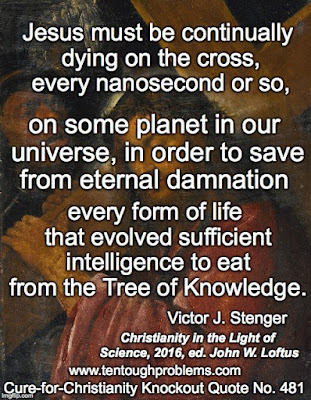 Lemaître had a hunch, of course, that God-Did-It is a falsifiable claim, and given enough time and research, something other than a god could be given credit for the Big Bang. I said earlier that the pastor was out of his depth discussing religion, and this hits us again when he dismisses cosmology: “…the fact is that none of us were there in the beginning to know.” He doesn’t seem to be aware of the evidence that has been gathered. Strenger, on the calculations about the number of planets: “This is not pure speculation. It is based on observations and the theory of cosmic inflation that is now empirically well established.” (p.116) Bratton’s comment is on a par with “How do you know Lincoln was assassinated? You weren’t there!” Robert Wilson and Arno Penzias weren’t there in the first aeons after the Big Bang, but they won the Nobel Prize for discovering the background radiation that still pervades the cosmos. Other recommended homework for those who have fallen behind on cosmology: physicist Sean Carroll’s article, “Why (Almost) All Cosmologists Are Atheists,” and his book, The Big Picture: On the Origins of Life, Meaning, and the Universe Itself. Bratton claims that getting to know Jesus “…is a decision that each person has to come to on their own, not from someone else trying to push it on them or persuade them with flowery words.” Wow…has he been in solitary confinement? Jesus is pushed on us relentlessly, and Bratton is part of the zealous bureaucracy. Selling Jesus is a multibillion-dollar business, one major fragment of which is televangelism. Missionaries knock on doors throughout the land, have pamphlet tables on the sidewalks and in the subway—and rare is the community that doesn’t have a least one church. We gotta have God on our money and in our pledge of allegiance. Jesus supposedly said, “Tell the whole world about me,” and boy, Christians can’t wait. He can’t imagine? Sorry, that fails as epistemology. What anyone of us can or cannot imagine has no bearing at all on what is true. This is his confession that he stands in horror at the thought of dying. That should never come into play in deciding the nature of reality. The cosmos shows no inclination whatever to make us feel better about becoming worm food. In fact, the way the cosmos is set up, everything dies—from microbes to planets and stars—and so it would seem, the cosmos itself. Let’s go back to the original question: ““What exactly is it about Christianity that causes you to reject it as a belief system?” Maybe its biggest fault is the depreciation of knowledge and the blunting of curiosity. The legacy of the apostle Paul has been disastrous: “The wisdom of this world is foolishness with God.” We can do so much better than that.